As a busy working mum of 3 little boys, my to-do list is pretty much never ending...and it always seems to be the same old tasks that are pushed down my list of priorities week after week. Lately it's been organising the boys old clothes! You know how it is, little ones grow so quickly and before you know it you've got a wardrobe full of clothes that barely fit them anymore. One thing I love about having 3 boys is that my favourite items from their wardrobes can be passed down from one to the other, before I had children I always said I'd never do hand-me-downs but I actually love seeing my youngest wear things that used to belong to his big brothers - it brings back such lovely memories. The part I hate though, is when the youngest has outgrown things. I always tell myself that I'm going to be ruthless and donate everything that he's outgrown to charity, but somehow I always struggle to part with most of it. Especially the t shirts! I have a thing for T shirts and because of the distinctive styles I choose, it's easy to associate a particular T shirt with a certain memory - a family holiday or a particular milestone in the boys lives, etc. And so they end up in boxes, stored in the loft, probably never to see the light of day again. Which seems silly and wasteful, but somehow I just can't part with them. That's why when I came across Too Many TShirts, I immediately recognised what a fantastic business idea they'd come up with - and I'm going to share a bit about them with you today. 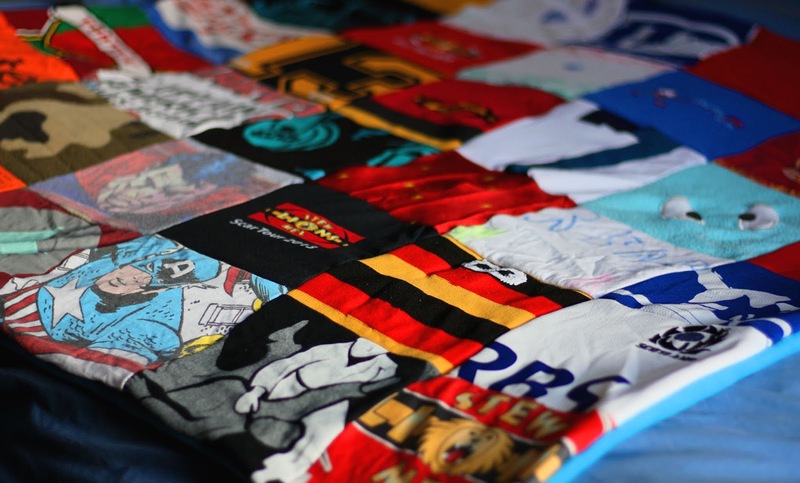 TooManyTShirts was started by Simon Bellamy last year, after his own Mum had used all of the t shirts he'd accumulated from his time spent playing for many University sports teams to make a memory blanket for him. There were so many of the T shirts and he wasn't wearing them anymore, but due to the memories attached to them he didn't want to let them go - and so a memory blanket made from them was the perfect solution. Simon loved the gift, and soon realised that so many other people would too....and so Too Many TShirts was born. Simon said " I know a lot of parents, like my own Mum, can do the sewing work like this themselves, but not everyone has the time, energy or equipment to hand. And sometimes people just want to prioritise time with family rather than spending days and days sewing! I wanted to make it as easy as possible for busy mums to send in their t-shirts, or little ones baby clothes. All our blankets come with a postage kit containing everything you need to simply and securely send back the clothes. No hassle, no need to buy postage bags, and no waiting in line at the post office"
In May, Too Many TShirts started a Crowdfunder campaign and managed to smash their £15,000 target in just 8 days! They plan to use this money to expand into a larger studio space, which will enable them to save and store their waste textiles and off-cuts, finding other ways to repurpose the materials. They plan to host workshops for clients of local charity The Matthew Tree Project to help teach them textile skills. 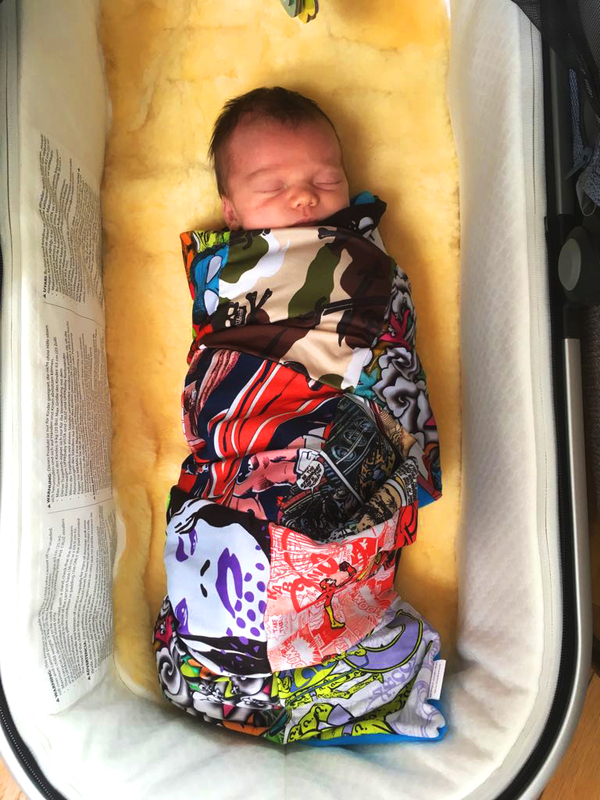 There 's just 1 week left of the crowdfunding campaign, and your support of this UK green start-up business could bring some great savings - both the children's memory blanket and the Adult t-shirt blankets are reduced significantly from their normal prices. You can also purchased a gift card or gift box - making it an ideal present for someone in need of a bit of a declutter or just somebody you know who would appreciate the chance to make something more permanent of sentimental items such as these. I think it would make a particularly touching gift for a parent, or a gift in memorium of somebody special. All of the blankets backed through the Crowdfunder campaign are "No rush" orders which means that you can send your Tshirts in any time in 2018 - so even if you're looking for a gift for Christmas or later in the year, now is still the best time to buy to secure yourself the best price.